When I first began this journey to invite light into my world with the help of sequins and color, the response was overwhelming. It seemed like people were inspired to invite their Muchness into their worlds. It became clear that, while it’s about so much more than sparkle, it is simply more difficult to feel that depressed on the inside when you are physically forcing yourself to sparkle on the outside. A lot of people told me that they LOVE the sparkle, but can’t really wear it on a day to day basis like I can. Those comments are what sparked this idea. I feel like everyone should feel confident using sparkle to tap into the light and energy and Muchness that lives inside them. The sparkle that helped me so much. And so, taking my strengths and experience as an accessory designer and my resources in the New York Garment district, the MUCHNESS BAND was born. What is a Muchness Band? Muchness Bands are silk & sequined Multi functional fashion accessories. Wrap it around your wrist, your ponytail, your bag strap, even your rear-view mirror! Wherever you catch a glimpse of it, offering you a gentle reminder of all the beauty and light that surrounds us. Using color theory + my own secret inspiration, every Muchness band color is linked to a different emotion that you want to convey or share. 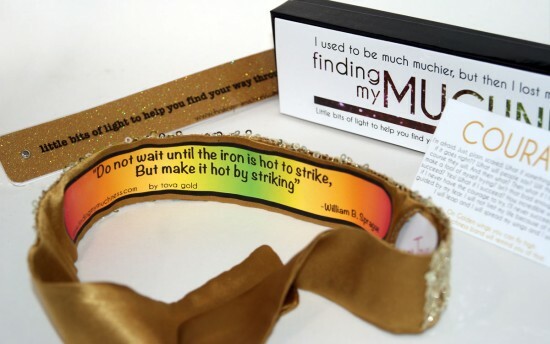 Every Muchness band is also printed with a customized inspirational quote on the inside. Words to hold close to your heart and keep you motivated to stay connected to your MuchnessMoments. And finally, Muchness Bands are designed with a secret pocket on the inside. Sold with a handmade book of “wish strips” this pocket is designed to hold secret love notes to your self of strength and inspiration. 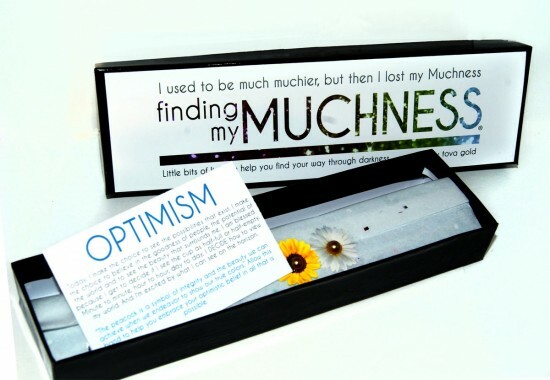 The Muchness band comes thoughtfully gift boxed and shares the sentiment of Muchness on the box lid. 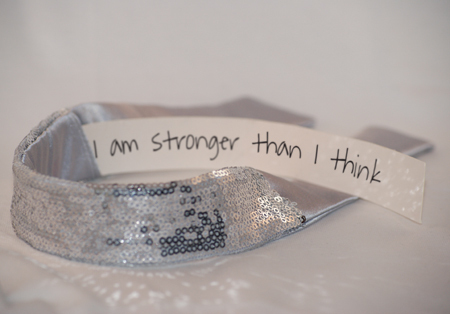 It is a beautiful gift to offer someone has gone through a rough time and is looking to re-find their strength. It is a gift to give yourself, when the day-to-day challenges of life make you feel out of touch with your Muchness. A portion of the proceeds of the sale of these or any items I sell on my website will be donated to foundations and organizations dedicated to ultimately ending infant loss, as well as those dedicated to helping the grieving families that experience it. ALL CONTENT ON THIS SITE IS COPYRIGHT ©2013 Finding My Muchness, LLC. All rights reserved. Absolutely brilliant and beautiful idea! Let me know when available!! Thank You Heather! I will!! Oooo…let me know when they are ready!